The Zubatto Syndicate is a 12-piece ensemble under the direction of composer and guitarist Andrew Boscardin. This exciting group — a highly original take on the Big Band and jazz orchestra traditions — made its debut in 2009 at Town Hall Seattle. Featuring a unique synthesis of reed instruments and electric sounds, brass and electric guitar and bass, Zubatto targets the musical place where Maria Schneider meets the Mahavishnu Orchestra, and the Roots meet Radiohead by way of Mingus. The music combines detailed arrangements and inventive harmonic ideas with rhythmic settings and idioms atypical of the jazz orchestra, as realized by the some of the top improvising musicians in Seattle. "Zubatto Syndicate is an utterly contemporary jazz big band — which is happily not as much a contradiction in terms as it might first appear. In fact, they're so modern – they might as well be from the future." 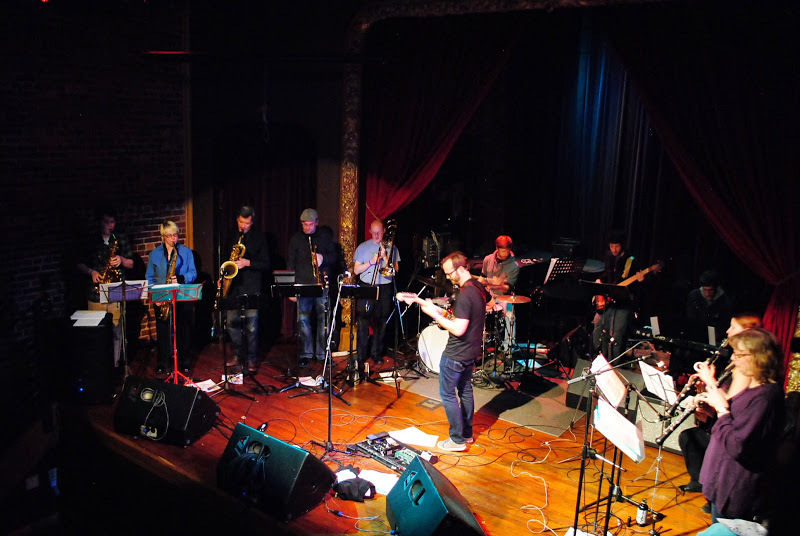 "The self-titled debut by Seattle's large jazz ensemble, The Zubatto Syndicate, proves that big band jazz can be as modern and daring as anything carved out by a smaller jazz combo and follows in the tradition of Gil Evans, the Carla Bley Big Band or some of Frank Zappa's oeuvre...The Brecker Brothers may have coined the term heavy metal be-bop, but The Zubatto Syndicate makes the expression a whomping reality." "Big-band music hasn't sounded this hip or vital in decades." "A big band unafraid to foray into the modern pop idiom." "The Seattle music scene is known for many genres of music, most notably grunge, indie-rock, and hip-hop. Zubatto Syndicate gives Seattle a good reason to add big band jazz to this list. Whether you're a jazz novice or enthusiast, Zubatto Syndicate's mass musical influence and improv talent will get you dancing and appreciating this local twist on traditional big band jazz." "Music that's solid and involving. On guitarist/leader Andrew Boscardin's compositions — which lay down intricate patterns and odd-hued harmonies — the band delivered some great soloing, especially from alto player Clark Gibson. This is a band that deserves a hearing." "It's really up-tempo. It's not the kind of thing you're going to want to listen to sitting down and watching. (Not) a sleepy jazz show where you sit down and have your drinks." "Big band the way you've never heard it before. Go so you can tell all the Johnny-come-latelies you heard it first. Editor's Pick"
"If you feel like dancing to Zubatto Syndicate, it'll be because you can't resist a snaky bass riff. In fact, if all goes well, you'll want to drop your pants. Boscardin's arrangements unfold in surprising ways... The solos are uncharted territory."